On Sunday night I got a notification that there were new LEGO sets on the Facebook Yard Sale site. I immediately noticed this one for the Harry Potter Hogwarts game. This was a game that came out around the time of Heroica and more games by LEGO. That was also the time when LEGO was producing Harry Potter sets. 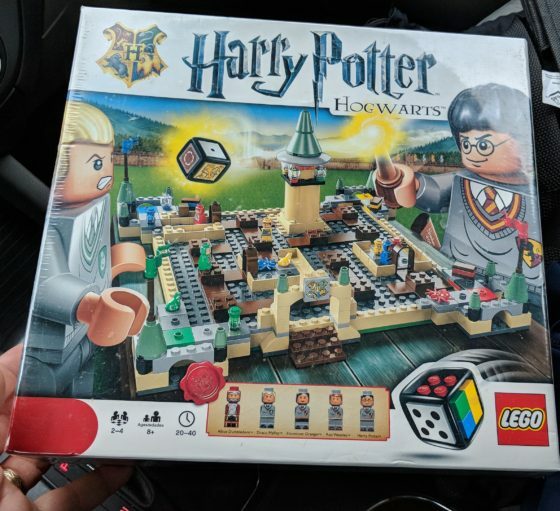 While I never did pick up any of those sets, the kids weren’t into it and there wasn’t much extra money, I do keep my eyes and ears open for them now. Eva is a huge Harry Potter fan and I knew that she’d be excited about this find. What’s better is that the game was only $10 and it is factory sealed. Perfect! I picked it up this morning from the home of the seller who is only one town away. I plan to play the game with the kids and also play it with Brian on Built from Bricks some week on our Livestream show. This week we are talking about the LEGO city that he’s been building but when we need another topic we will head to this one.